Iowa CTS Cleaners is a highly specialized cleaning company that provides bio-hazardous, blood cleanup services for people involved in accidental or trauma scene situations. 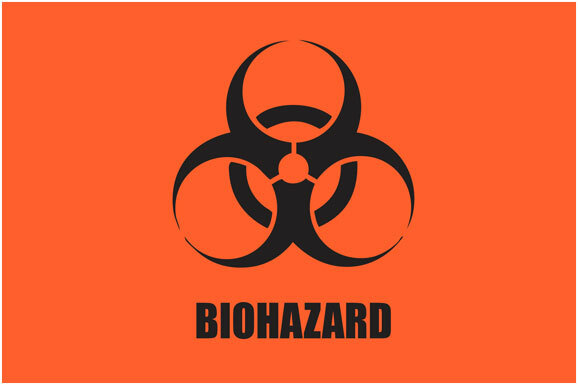 Our dedicated team of highly trained biohazard cleaning professionals can safely and discreetly remedy any blood scene involving biohazardous or infectious wastes and dispose of it properly. Biohazards such as: blood, bodily fluids, and tissues are contained, removed and all surfaces disinfected to provide a clean and safe environment. Iowa CTS Cleaners relieves homeowners, property managers, co-workers, families and friends from emotional trauma and physical hazards associated with cleaning a bio-hazardous scene. We advise that family, friends, co-workers etc should not try to cleanup a bio-hazard scene due to the potential bloodborne pathogen dangers and the emotional pain associated with the victims. We provide strict privacy for any biohazard cleanup at a trauma scene and drive un-marked vehicles to a scene. We work with all insurance companies if insurance is used as payment for cleanup. Beware of NON-local blood scene cleanup companies that advertise on the internet and appear local. Hire a locally based certified and qualified professional - Hire Iowa CTS Cleaners! 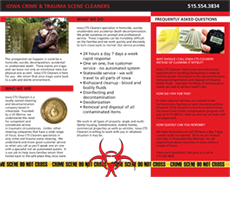 Contact your local blood scene cleaning service, Iowa CTS Cleaners to professional remediate biohazards associated with a trauma, accident-slip and fall, or assault of any kind to a pre-biohazard scene condition. Iowa CTS Cleaners is locally owned and operated and our technicians will provide understanding to any concerns related to a blood cleanup as well as privacy for all work performed.